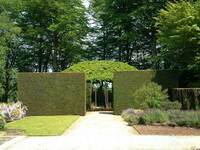 An English architect and garden designer. 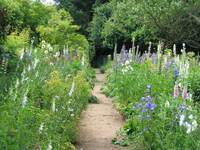 When he was 20, Edwin Lutyens met the 46 year old garden designer, Gertrude Jekyll. She became a formative influence on his work. They collaborated on many projects, producing some of the best country houses and gardens which have ever been made in England. Their style was Arts and Crafts. 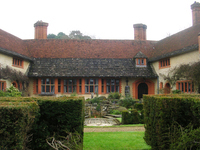 To begin with, Jekyll said what type of place to make and Lutyens produced the drawings. 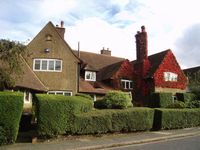 As Jekyll's eyesight deteriorated, Lutyens produced the designs and Jekyll did the planting plans. When Lutyens worked on his own the projects were more formal and less 'comfortable' - he did not enjoy gardening and seemed not to understand the types of space which gardeners like to have.